Butterbur (Petasites hybridus) is a native shrub of Europe, North America, and Asia that has been used by the herbalists for centuries. 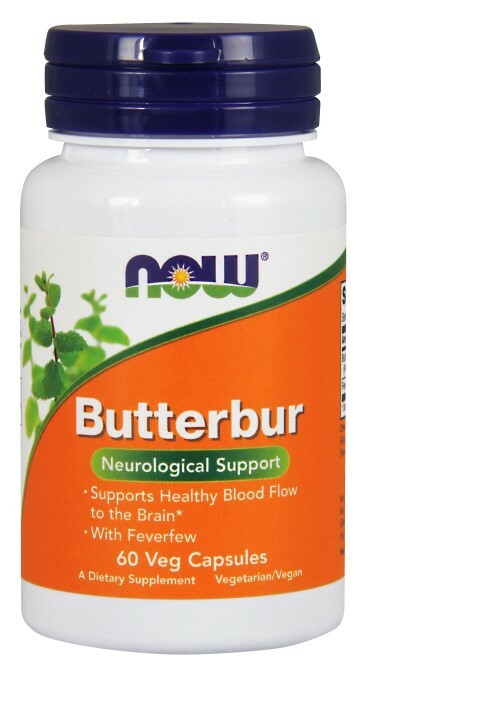 Modern scientific studies have demonstrated that Butterbur supports healthy blood flow to the brain and healthy neurological function. Petasins, the active constituents in Butterbur, have been shown to play a role in minimizing the frequency and severity of neurological discomfort triggered by bright lights and stress that occasionally occurs in healthy individuals. Suggested Usage: As a dietary supplement, take 1 Vcap- 2 to 3 times daily. Consider taking this product in combination with NOW- White Willow Bark, Super Omega 3-6-9 and Ginkgo Biloba. Other Ingredients: Cellulose (capsule), Cellulose, Silica, Magnesium Stearate (vegetable source), Stearic Acid (vegetable source) and Maltodextrin.